Well I finally got the wiring harness out of the cab I just need to circumvent the interlocks on the transmission in then things will get really ugly. I know things look kind of scary but you haven't seen anything yet once I cut open the wiring harness to delete the unnecessary wires it gets really ugly.. And you know what the real scary part about this whole thing is???? I know where most the wires went and what they did. . This is the reason why a lot of people spend the big dollars to buy in engine management system or by someone else's wiring harness. Someone else already mapped out the wiring harness and is able to make quick clones from the work that they did and selling it to you.. This isn't rocket science, it's a very slow and painful process of removing one item at a time and see what happens,, most the time nothing happens. But when it does you need to figure out why and how to circumvent it. Sometimes figuring out what the source of the issue is take several hours and the circumvention can take even longer to figure out. When taking on a task like this you always need to remember that the solution is out there you just need to find it. If not you'll end up buying somebody else's creation. And you'll find yourself unable to troubleshoot any issues that come up in the field without the help of the original manufacturer. And they will probably tell you that you just need to buy a new one from them. WOW... That's a lot of wires! I second that !!!! 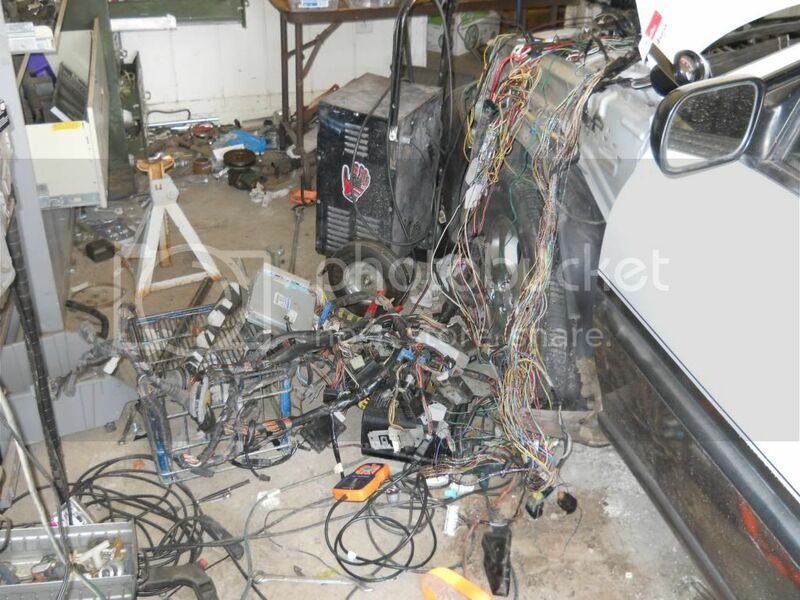 wow ..... so many wires... what again are ya gunna do swap the motor to a Baja? yep ... I am going to put the motor in my baja. Now thats a project . Bet its gunna be sweeet though when you are finished. All I worked a bit more on the car today I've successfully grafted the car away from the motor harness. I am going to continue to strip away the excess wiring from the harness until my performance motor arrives. At that point I'll make the conversion from the car to the floor in things will get really interesting. I started the use tow tags on some of the connection points I'm starting to forget where things went and how they were configured if you see my photos and you happen to see yellow wire nuts that would be a clear indication of the bypass point. wires that are still alive and are unknown have gray duct tape on the ends to keep them from shorting and blowing out my ECU. You also notice a wire going randomly from metal bracket to metal bracket this is a ground wire one of my biggest challenges will be with the grounds. So far the grafting as gone well with not too many upsets. 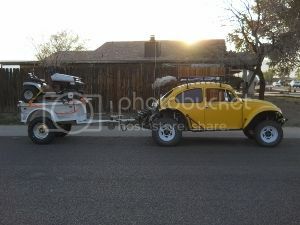 As I continue to read about the performance motor that I have purchased I believe with the emissions standards for a 1969 VW beetle and running higher octane fuel I will be able to pass Arizona omissions with out putting in my 1600 single port motor. If I come across something interesting I be sure to photograph it and post it. I received my new motor late Friday and started work on it right away on Saturday after 18 hours it was running!!!!!! I changed out the timing belt and cleaned up some of the accessories after debugging a few loose wires and a few missing grounds everything seems to be working great now I begin the task of removing all the unnecessary wires this is actually the easy part after I removed the unnecessary wires than all need to cut in seal the harness to make it weatherproof I'm not happy with the Gromit they came with the Subaru motor it's looking like I need to spend another day at the junkyard to locate one. I've checked the compression and it is between 200 psi and 205 PSI all around it looks like I'm in a be running 91 octane as the scanner shows it's not liking the old fuel that I use in my lawnmower. Oh well... I will try 87 octane again when I install it in my Baja. Well I'm happy with my replacement motor it should put out about 187 hp. That's a little close to my 200 hp rating on my 091 transmission. I've had the US version of this motor in my car before and I was able to get about three years out of the transmission before blew up. I went to the dump yesterday and had my car weighed it looks like I'm it 2400 pounds fully loaded. 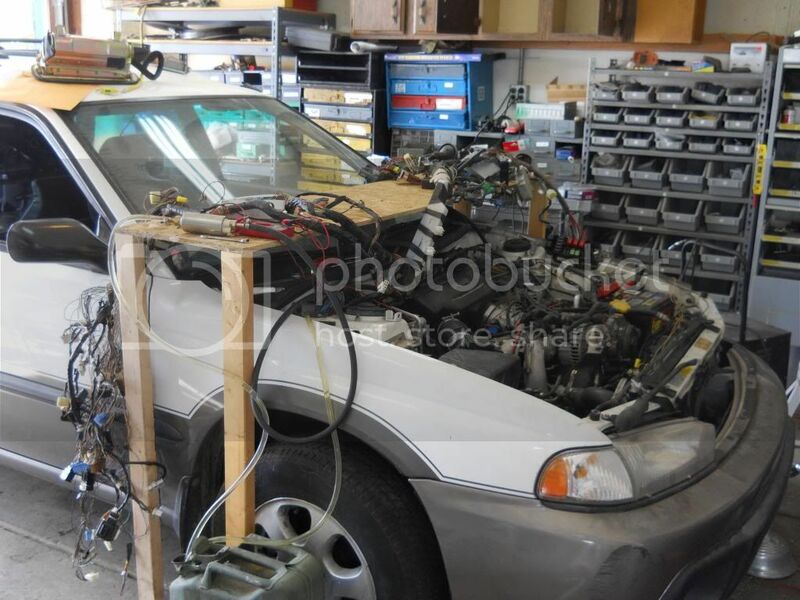 Plan on weighing the car after the Subaru motor is installed..
Everybody keeps throwing out that this motor's only 25, 50, 75, 100 pounds heavier than a Volkswagen motor... I've never really taken the time to find out how accurate these claims are.. Is it the way to the motor when it's dry or is it the weight of the motor with all the additional hardware needs to be installed to make it function???? most time I really don't care .. I plan on keeping my baja until I'm dead,, my wife likes the window, AC, and heat.. And I don't even feel it when I tell it behind the motor. Now that I'm on the downhill side of the wiring harness take the afternoon clean and paint part,,.. Minor replace the water pump and some pulleys that I'm not happy with.. I thought about powder coating everything but I don't want to take the time it's starting to get hot. I have decided that I'm going to powder coat the intake manifold after I finished making modifications to it. I have a donor intake manifold that I will be using. Maybe I'll get crazy and have it polished. So far this is the easiest wiring harness that I have ever done. 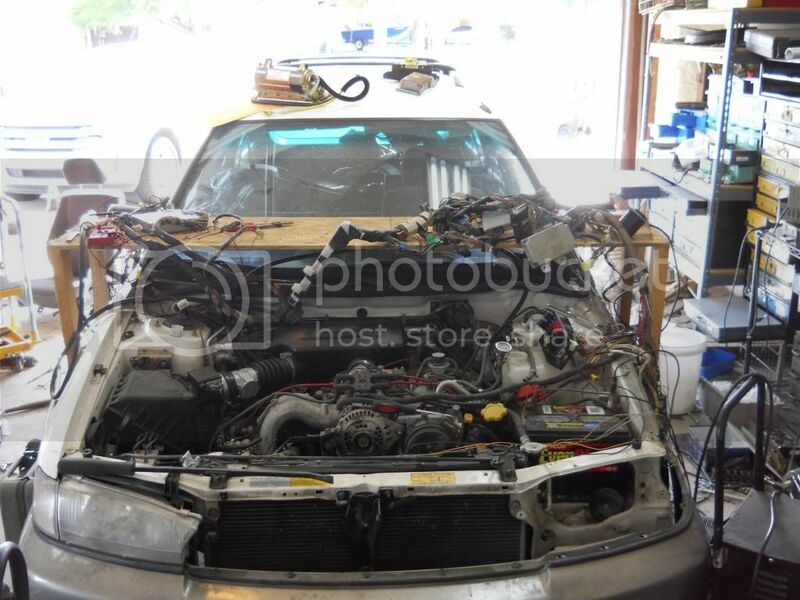 If you were thinking about going with a Subaru motor now would be the time to reach out to me and let me know while it is fresh in my mind of what you need from the boneyard harness. At this time it would be easy for me to identify the bypass and override points for you. My italian Wife thinks you need some sort of gravy to go with your pasta. I'm looking at it, I think your problem is the green wire. Yup the green wire. In every movie ever made when they try and defuse the bomb it's always the green wire. There. Glad I could help. My god man that is a lot of wires. I'm also glad to see the tail pipe made it out of the garage.